Jon Chadurjian’s comic The Bad-ventures of Bobo Backslack, reviewed. The Bad-ventures of Bobo Backslack is demented, disgusting, and very funny. Poor Bobo Backslack can’t catch a break. He’s just discovered he’s allergic to cats—and his new neighbor keeps bringing a tabby over to visit. He’s meeting the girl he’s got a crush on—but he keeps barfing all over her. He just wants to get a little gardening done—but a local snake won’t stop eating him, donning his glasses, and impersonating him for weeks at a time. 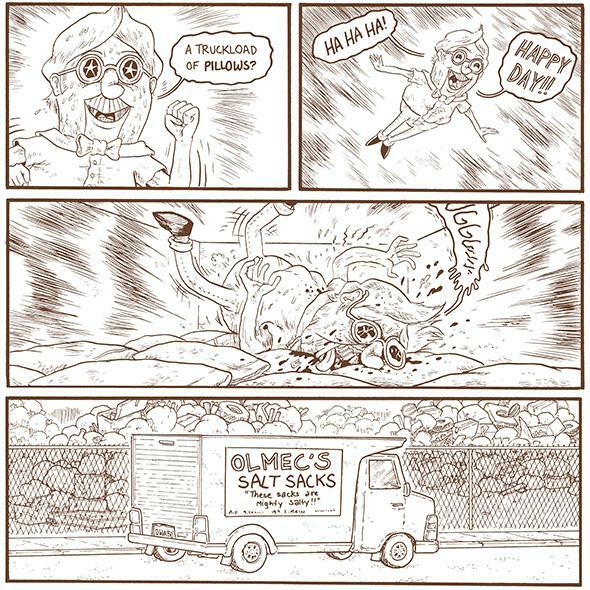 Jon Chadurjian’s demented and disgusting comic The Bad-ventures of Bobo Backslack follows his sweating, sneezing, big-hearted hero from disaster to disaster. Bobo has a sham job, no romantic hopes, and no friends; even the squirrel he talks to in the park has dropped dead. But Bobo remains naively chipper even in the face of beatings (“What a razzing!”) and betrayal, so Bobo Backslack reads like an Archie comic from a profane, cruel parallel universe. Chadurjian is already known in the comic book word for his delightful and informative pinball zine Drop Target, drawn with Alec Longstreth, but Bobo Backslack is both more ambitious and far, far stupider. Much of the book’s appeal comes from Chadurjian’s funny, painstaking cartooning, so packed with detail it nearly drips off the page. He’s got a real knack for timing a gag, and he’s unafraid to crank a joke way past the point of comfort—as in an unforgettable sequence in which Bobo, who’s nervously eaten five gallons of alphabet soup, can’t stop barfing on everyone, only to discover with horror that the vomited noodles spell out crude insults on the ground. It’s a joke that shouldn’t even be funny the first time, but Chadurjian’s commitment to the bit (and Bobo’s incessant “Oh geez” responses) made me laugh very, very hard. We’re very proud to have Jon Chadurjian illustrating the January issue of the Slate Book Review. The Bad-ventures of Bobo Backslack by Jon Chadurjian. AdHouse Books.